At last, someone who gets round to things on MY kind of timeframe! I’m chuckling now. Thanks Kavey, glad to hear it’s not just me. Yum! I think you made the right decision to remove the seeds, I left them in when I made some last year and they spoiled the texture. Serves me right for being lazy! Yes, there’s something about curd that cries out for it to be smooth. But what did you think of the flavour? You’re right. Flavour-wise it was wonderful, to the point that I ate most of it straight from the jar with a spoon. 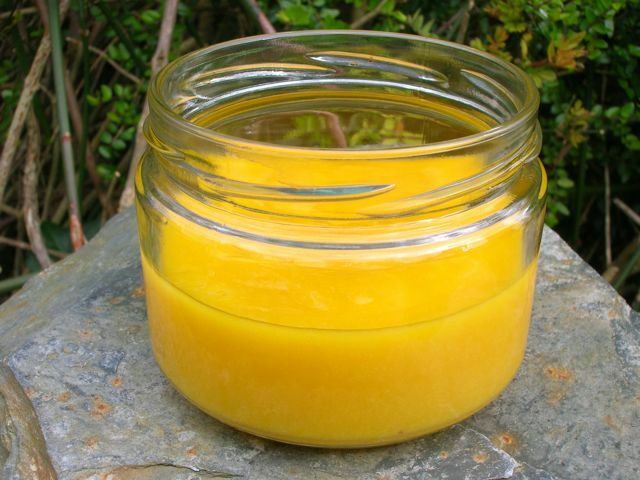 Just seen your recipe for apricot curd – I have some apricot puree in the freezer so I might give that a go this weekend. Katie, I didn’t know you could buy it, so that’s really interesting. I suspect homemade is nicer though. Thanks Laura. Sunshine is becoming a bit of a theme – you never know, we might just get to see it some time this month! If only passionfruit were plentiful, I would be making tons of it. Wow I am loving the sound of the passionfruit curd cake, can’t wait to see how that turns out! Passion fruit is one of my all time fave fruits, I can just imagine how delicious this must be! Thank you. I was quite excited by it, I must say and it was nearly as good as I was hoping. Should be posting about it soon. Oooh, this looks delicious! We make ours the lazy way in the microwave, and I usually don’t bother to sieve out the seeds, but I might next time! I love the hint of cardamom! Oh Celia, I do so envy you passionfruit – that with avocados and lemons. I’ve made cakes with passionfruit before and left the seeds in, but I think I prefer it without. your passionfruit curd sounds heavenly..yum.. Thanks Hazel – rather wishing I had a few more jars! Yum! definitely worth the wait 🙂 I love the bright yellow colour! Thanks Ros, rather wish I’d got on to this a lot sooner – colour and taste are so good. Alida, it’s really delicious and has quite a different flavour to lemon curd – although that’s also delicious if home made. That looks simply stunning. I love passionfruit so will have to give this a go. Marcus, if you are a passionfruit fan, this is a must. Yes, given a choice I’d go for passionfruit, but lemon curd is delicious too. I’ve only tried it with white chocolate so far, but I’m sure it will be delicious with dark too. Oh dear! I am not to be trusted around lemon curd as it is, this looks even better! It looks fantastic – what an amazing colour! Thank you MCB, just wish I could get hold of passionfruit more easily and then I’d be making loads. That looks utterly amazing. What a beautiful colour. I’d be with you on leaving the seeds out – I know they look quite pretty but I hate crunching down on them. I must get round to making this really soon! It’s really not much of a faff to take the seeds out – well worth it I reckon! Do hope you manage to make it AND enjoy it C.